Practically this ship consists of a huge recycling system and an enormous warehouse. After a battle there are fragments left from the destroyed ships that the recycle collects and transforms into pure resources. Unfortunately though, the ship is not able to carry powerful engines, reducing the velocity, so that there is room for the recycling systems and the warehouses. 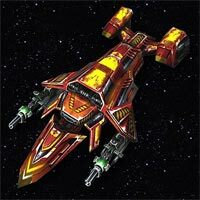 All ships get an equal bonus from researches for velocity, power and structure. After every battle these ships can collect and recycle from 25% to 50% (percentage is defined randomly and varies in the different universes) of the structure of the destroyed ships.